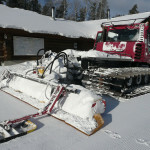 Grooming is a priority at Temiskaming Nordic. Our volunteer groomers take pride in providing first-rate quality groomed trails for track-set classic and skate skiing. The smooth sandy surface of our trails allows grooming to begin with 5 cm of snow. With the availability of light grooming equipment at our club, members are able to enjoy skiing at the very start of the season. At the start of the season, our two Alpine II double track snow machines are ideal rollers to pack the first snowfalls. 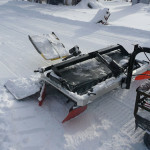 Later, a 72’’ roller compactor pulled with our Yamaha VK snowmobile is used to pack the snow into the trail without moving any to the side. 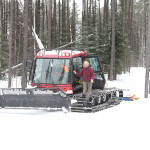 As more snow accumulates, an 84’’ Ginzugroomer is used to further level and build the trails and set a classic track. 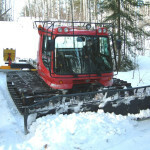 Once the packed snow base exceeds 10 cm and throughout the skiing season, our Pisten Bully PB200 is used for most of the grooming. This PB 200 is equipped with a 13’ articulating tiller to recondition the snow and independently operated track setters. This equipment works together to deliver a wide level skating lane and firm smooth classic tracks. 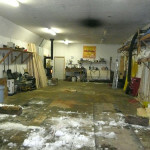 Our skiing season normally begins in late November/early December and extends until mid-April. 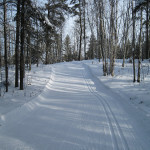 Temiskaming Nordic is always pleased to welcome skiers to enjoy our scenic and well- groomed trails.